In the mid 1990s, I received a simple postcard from a dear friend who was visiting San Francisco. The card’s image read “Beauty and Sadness” and was humbly embellished in palimpsest-style by beautiful Asian calligraphy running in columns around the English text, which was evident in its own simple beauty, a card catalog record for a book by Yasunari Kawabata. 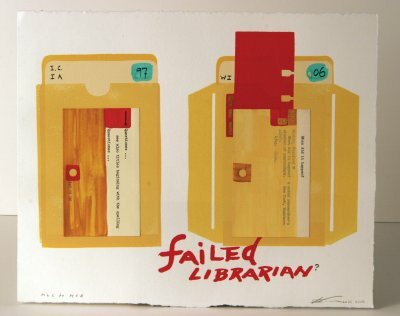 It was this card that made me aware of the public art project organized by Ann Chamberlain in the early 1990s, which drew upon the discarded catalog of the San Francisco Public Library. The seed of “Beauty and Sadness” was posted near my desk for nearly 10 years before it sprouted anew in 2004 when the University of Iowa Library staff received a notice that our libraries were discarding the public catalog and that “If there are projects that require the use of card sets from the old catalog” staff should withdraw the cards they needed. While this notice did not anticipate “art projects,” the cards found themselves in an active retirement. The cARTalog project was thus born. cARTalog is a community-based art project intended to honor the UI Libraries retired public card catalog and offer a rebirth to the long-loved system which would otherwise be headed for the recycle bin. We were able to salvage only one fifth of the Libraries’ public card catalog for the cARTalog project, approximately one million cards. Participants—from Iowa, across the country and around the world—were invited to adopt cards and recreate a home for them in whatever way was most meaningful to them. Cards were requested by over 500 individuals covering a well-rounded demographic of preschoolers to retirees, students and teachers, children and parents, and among these participants emerged artists, writers, librarians, comedians and musicians, to name a few. The cARTalog Project involved several non-juried satellite projects including an online gallery, a K-12 Exhibition, a Mail Art Project and the General Exhibition, which opened in April 2006 in North Exhibition Hall of the Main Library. The General Exhibition is the culmination of the project and features over 60 pieces which include a variety of sculpture, assemblages, books, prints and even clothing. Robert Possehl, an “itinerant imagist” and featured artist in the exhibition, views catalog cards as books. He celebrates where they take us and sends the cards skyward in a hanging installation, entitled “Relationship Requiem.” Book artists among the show include Jim Canary, Beth Carls (Blue Valentine Press), Louise Coates, Lucy David, Cheryl Jacobsen, Roberta Lavadour (Mission Creek Press), and Mary V. Marsh. The General Exhibition closed the first week of July, but we are considering other exhibition venues. The success of the cARTalog project is due to the participants and their enthusiasm. While the individual pieces provide a diversity of artistic vision and intent, as a collective whole they speak to the spirit of collaboration, the connection of people and community, the importance of stories and memory, and how libraries play a role in all of these phenomena. The art offered up by cARTalog artists is evidence of our curiosity, nostalgia for the “material familiar,” and aspirations for its future preservation. Over the course of the project, I was challenged and provoked by a series of interesting ethical and philosophical questions. What’s at stake? Preservation is at stake . . . but preservation of what? Preservation of the Artifact. It is also a library’s mission to house and preserve historical artifacts, and the decision to discard a catalog is not an issue to take lightly. What information is lost with a discarded paper record? Likewise, to alter historical artifacts also raises ethical questions with respect to preservation issues. Preservation of the Idea. Many of cARTalog artists did alter the cards for the sake of art, and this would seem to contradict the preservation of the artifact. But by recreating the artifact-otherwise-discarded, we recycle the artifact while preserving both the idea and memory of the card system. And that, too, is a valuable. In exploring these questions and objectives, I have gained some insight through the work of David Bunn (www.the-declaration.com/1999/04_08/features/bunn.shtml), Nicholson Baker, as well as other writers and artists. The answers are yet elusive. There is an infinite and complex beauty in the cards; there is a sadness, for many, in their retirement. Beauty comes full circle when the cards are reinvented by those who revere them and all they represent. To learn more about the cARTalog project, request cards, or visit the online gallery, visit the website www.lib.uiowa.edu/pr/cartalog/ Cards will be available through the end of August 2006.